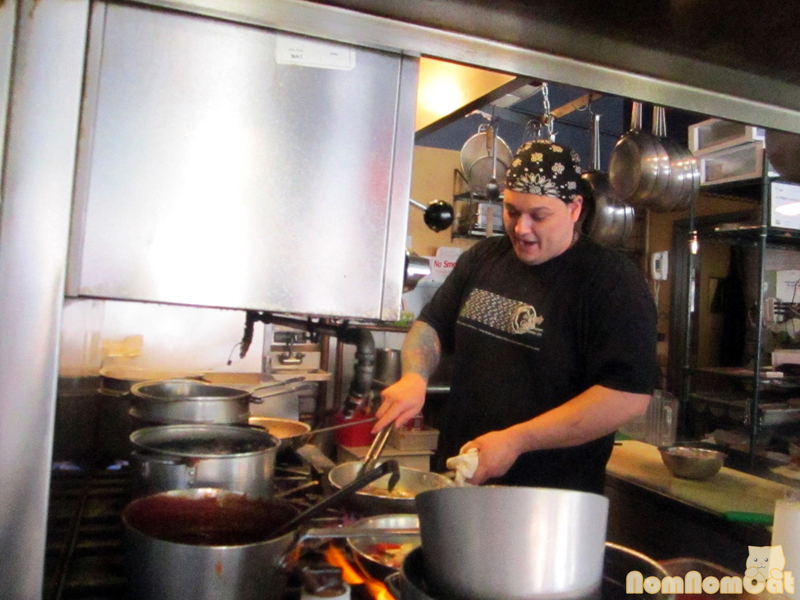 After watching the Boston episode of Bizarre Foods America and being inspired to visit some of the same places that Andrew Zimmern did, I was especially excited to swing by The Daily Catch in the North End to try the fresh squid ink pasta. 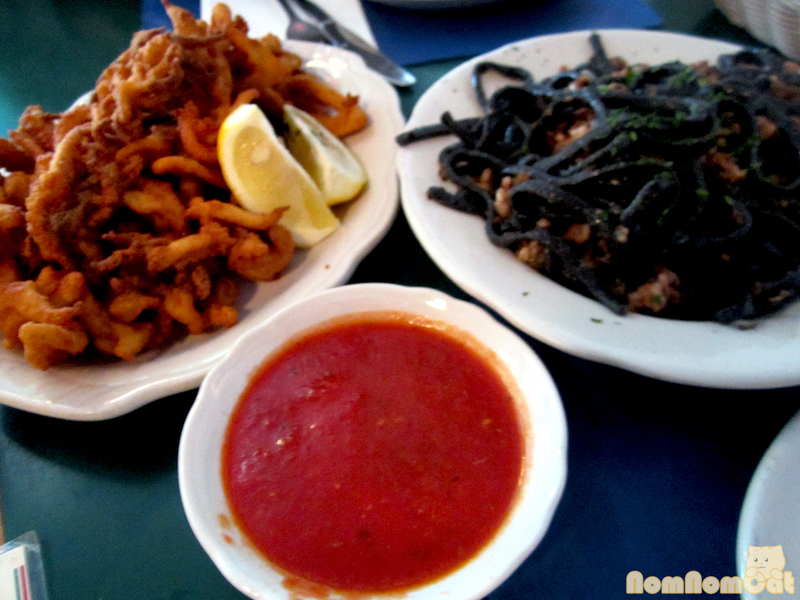 Whenever I see a menu with an al nero di seppia or tinta de calamar pasta dish, I just have to have it… especially here at The Daily Catch, where the infamous black pasta (homemade!) 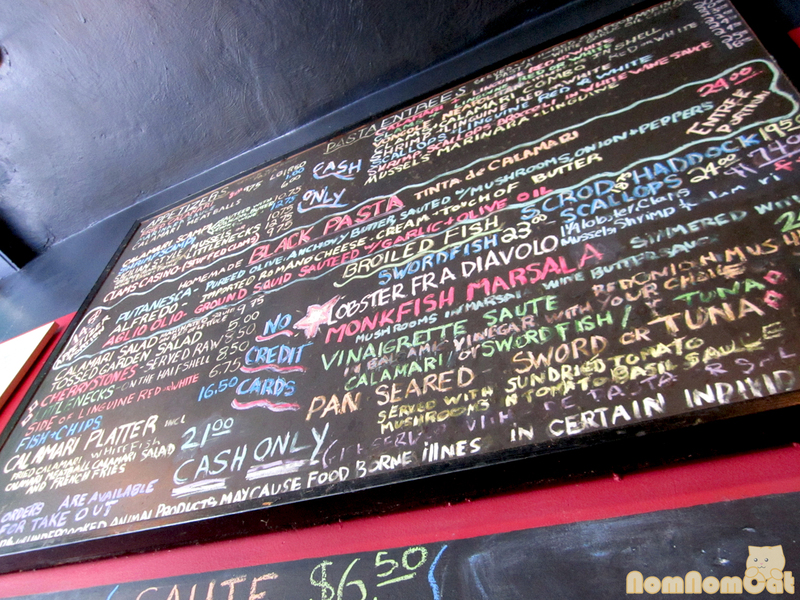 stars in the center of the chalkboard menu. The first thing we noticed was just how small the restaurant is – a teeny, tiny shoebox that seats no more than 20 people at any given time. The dining area wraps around a very open kitchen. So open, in fact, that I could feel a slight breeze each time the chef reached for the giant tin of olive oil stored just behind my spot. It definitely added to the experience being able to watch the process and listen to the controlled chaos as the friendly guys helped (and poked fun at) each other. 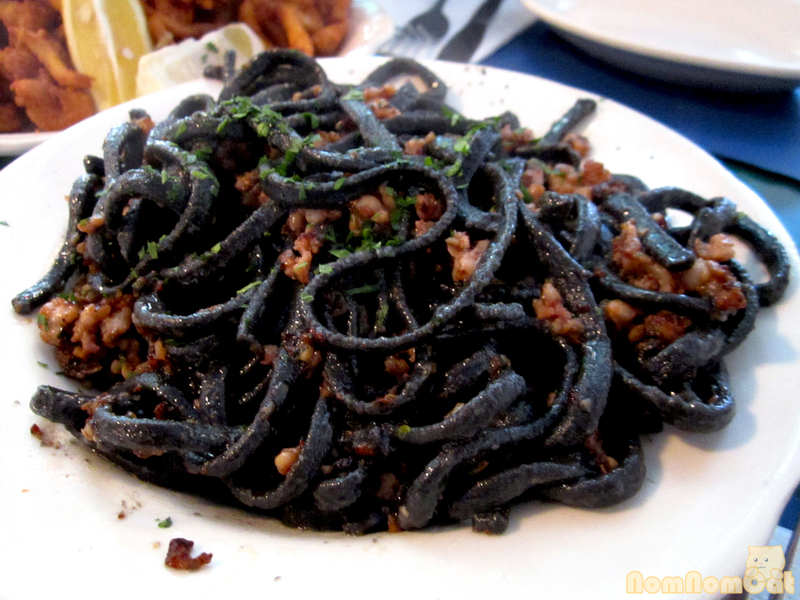 Of course, I had to try the homemade black pasta and selected the appetizer portion prepared aglio olio. Though literally translated as “garlic and oil,” the pasta aglio olio here is so much more. The perfectly al dente pasta was coated in garlicky sauteed ground squid and glistening (but not greasy) with olive oil. The homemade pasta was pulled with a thickness reminiscent of udon and sharing its chewy and firm texture. I savored every last bite and, at the end, used a single tine of my fork to pick up the remaining crumbs of the flavorful ground squid. SO FREAKING GOOD. Martin was hoping to try skate (as seen on TV) but the chef had not even heard of the fish, let alone serve it on his menu. So he decided to go with a small order of the fried calamari and a side of marinara sauce. 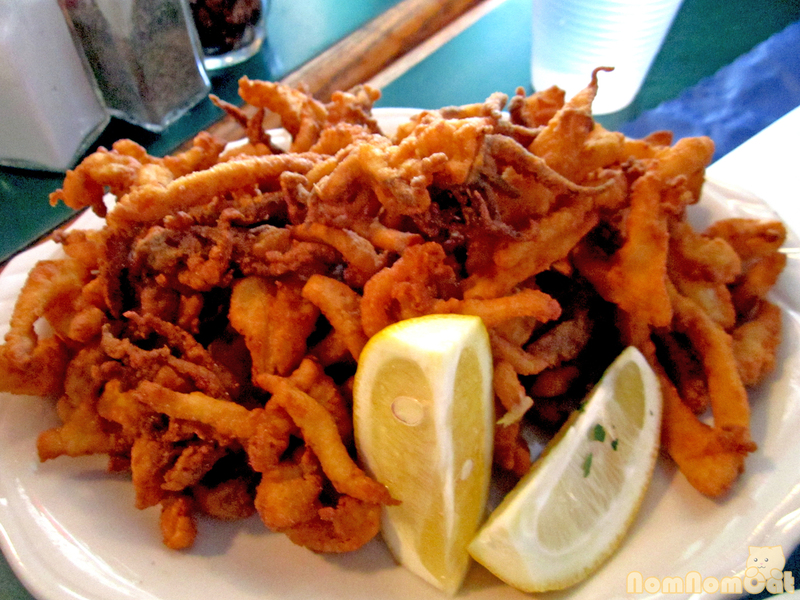 You really can’t go wrong with fried calamari, but the one here is pretty stellar. The crunchy batter was not too thick or grainy, the squid was fresh (the body was cut into strips and not those rubbery pre-cut frozen rings), and there were plenty of leg/tentacle pieces to fight over. The sauce arrived piping hot! Frankly, if I lived anywhere near the North End, you can bet I’d be lunching here on a daily basis. The dishes we ordered were delicious and I appreciated the no-frills (I’m sensing a theme here) atmosphere. Just remember to bring cash (and lots of it if you plan to experience the Lobster Fra Diavolo at about $75 for 2). Also, we were seated right away for our lunch visit, but we hear the wait could get crazy at times. And it’s small, so plan smart – don’t take your whole entourage here, just a BFF or two. Enjoy~! See their Yelp reviews here!